You will find Résidence La Roseraie set in the wooded hills of northern Périgord Noir, just 8 km from Hautefort Castle. We propose two luxury Villas: Villa Rosa and La Truffière, one Cottage: Lou Nouzier and a Mobile home: L'Acacia. The holiday accommodations are respectfully situated on the park (2,4 ha) to ensure the privacy of all guests. Villa Rosa, built in 2003, is a modern, luxury holiday villa that can accommodate up to 4 adults and 2 children -13 year. The total surface area of this south-facing villa is 120 m², and includes a covered terrace. 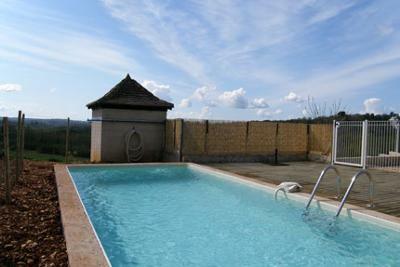 The panoramic views over the Vallée d'Auvézère can be enjoyed while sitting on the terrace. The entire enclosed private swimming pool (7-3m, 1,25m deep) is just a few meters from the accommodation. This pool can be used from May to the end of September. Lounge chairs and ambient lighting have been placed on the terrace for your comfort. A BBQ is also available. Inside, you are greeted with a pleasant ambiance and a variety of comforts.